Get in touch with an experienced and expert San Jose, CA sewer line repair and replacement professional today at Genmor Plumbing by calling (408) 933-9874. Click here to see our current online coupons and specials. Click here to review what other San Jose, CA customers are saying about their Genmor Plumbing sewer line repair and replacement service experiences. Sewer lines can get damaged and cracked and it can often take some time before a homeowner becomes aware of a problem. When a sewer line cracks, it can potentially cause extensive and costly property damage. This is why you want to act fast and call Genmor Plumbing soon as you become aware of a sewer line issue. Sewer lines come in different materials and each are susceptible to certain issues. Sewer pipes that contain metals can become corroded and rusty. This may eventually cause them to break down. Some clay sewer lines become brittle and crack due to earth shifting if they were not installed with appropriate support. Plastic PVC pipes can also become brittle and crack due to fluctuating temperatures. What Are Some Of The Reasons Sewer Lines Break Down? Sewer lines can become cracked, broken, misshapen or collapse due to any number of reasons. When this happens, the sewer line will leak and may cause significant damage if not contained and repaired quickly. 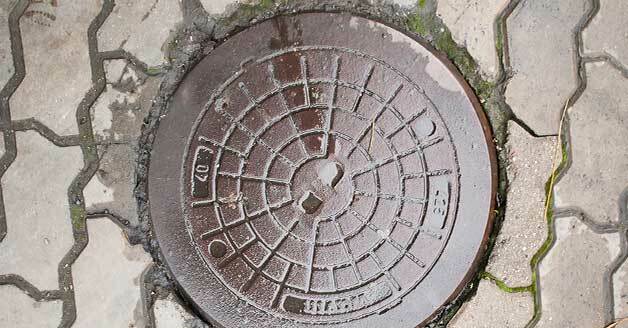 Sewers may simply break down due to age of the pipes or the ground shifting over time around them. The breakdown of sewer lines can also occur due to a build up of material such as food particles, grease, hair and other items that clog and add pressure to the pipe. Improper maintenance may also cause a breakdown of your sewer lines. Trees can prove meddlesome when it comes to sewer lines. Deep tree roots can infiltrate your sewer lines and can often break right through them. How Can I Tell If There Is A Problem With My Sewer Line? It can often take some time before you become aware of a breakdown in your sewer line. Some things that may alert you to a problem can be a lack of water in your toilet, a very slow drain (especially in your bathtub) and sewage backing up into your toilet bowl or tub. This sewage backup is often accompanied by gurgling noises as the sewage is pushing up through the pipes. Sometimes a sewer line backup can start from the municipal sewer line. Sewage backup can be toxic and pose a health risk to your and your family so it is crucial to get your Genmor Plumbing expert over to repair or replace the sewer line as quickly as possible. If you detect a sewer line issue, call your Genmor Plumbing expert in San Jose, CA at (408) 933-9874. We will send a licensed professional to assist you immediately. Our expert sewer line repair and replacement specialists are always on call to respond to any plumbing emergency you may have. We offer free estimates and your 100% guaranteed satisfaction.